The Corkscrew hazel tree is an attractive small tree or large shrub with heart shaped yellow foliage that appears in spring, turning green throughout the summer before buttery-yellow again in the autumn. This twisted hazel is most popular for its contorted branches that twist and corkscrew in spirals providing year round interest but particularly in winter when the leaves do not disguise the interesting form. Long yellow catkins on bare branches, from winter to spring, make a pretty feature and the stems are often used in flower arranging. Corylus avellana 'Contorta' is a small tree or large shrub that will grow to 4 x 4 metres in 20 years and eventually form a rounded shape. 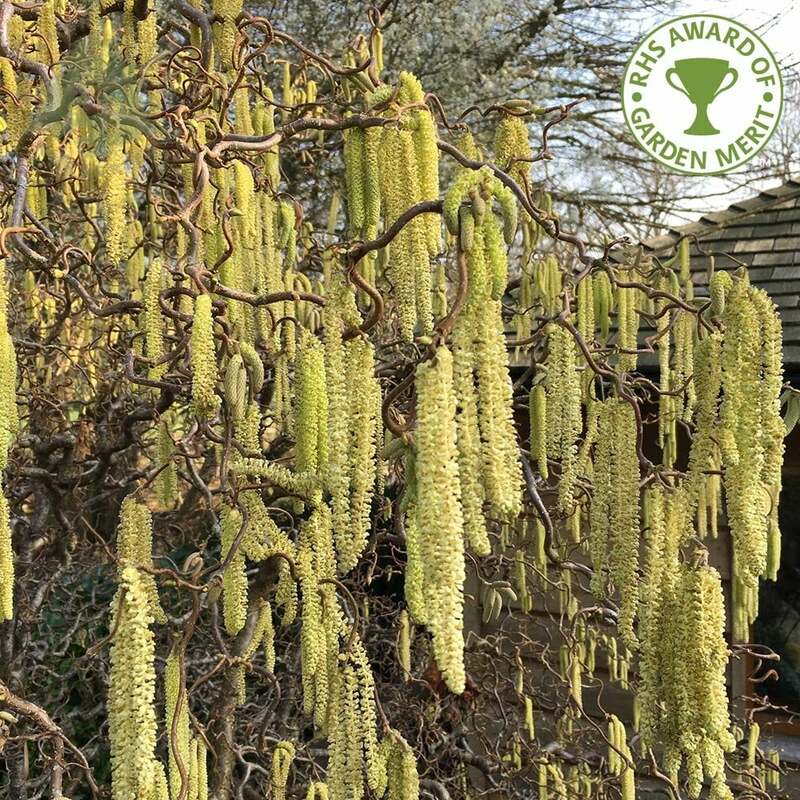 This twisted hazel tree do well in any soil type (with a preference for chalky soil) that is moist but well-drained in partial shade or full sun. Exposure is well tolerated by this small, eventually rounded, ornamental tree. Our pot grown Twisted Hazel trees can be planted at any time of the year, unlike bare root trees. Start by removing weeds and grass within a metre of your intended planting hole. Dig a square hole as deep as your root mass and approximately 2x as wide. To help your tree establish more effectively, especially if you have poor soil, we advise sprinkling root grow in the hole. If you’re planting in spring, summer or dry weather, water well and regularly for the first few months. Make sure to keep an eye on young Corkscrew Hazel trees and increase watering if there are extended periods of hot or dry weather. If you’re planting in autumn, you may only need to water your tree a little. We stock a range of irrigation kits, suitable for a variety of planting schemes. Twisted Hazel trees do not require regular pruning. If you wish to tidy up your hazel shrub, do this during the dormant season. Focus on removing any damaged, diseased or overcrowded branches.